The fifth grade classes have been learning all about SPACE during second quarter. We've talked about atmospheric perspective making landscapes, foreshortening self portraits, and then we applied the mathematical skill of drawing in one-point perspective. We discussed the vocabulary (horizon line, vanishing point, orthogonal, parallel lines) needed to understand perspective drawing. Then we had a chance to practice using squares, circles, even stars and the letters of our name! But the final project for this technique was this awesome Peter Max-inspired art. 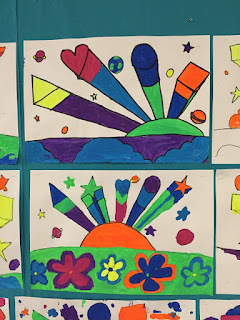 We created a landscape in the style of pop artist Peter Max and then filled the sky with geometric shapes. We used one-point perspective to make the objects appear three-dimensional. 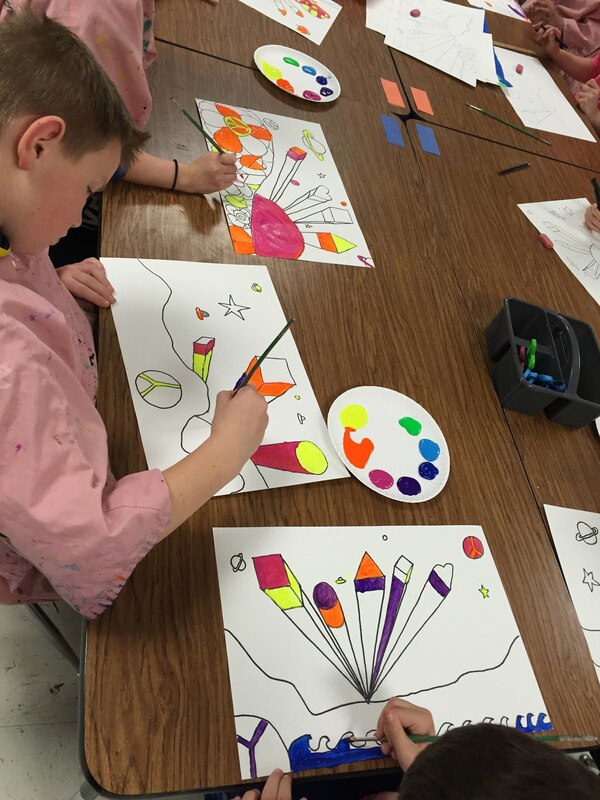 Finally, we used neon paint to really make our projects POP!